Guillermo del Toro is rumored to be developing a videogame series along the lines of Mass Effect. Movie director, writer, and producer Guillermo del Toro loves videogames so much that he's making his own. Del Toro hasn't made an official announcement yet, but we do know he's got big plans for a series that will come out of THQ in 2-3 years, and that it'll have horror elements. Though an announcement will be made at this year's Spike TV Video Game Awards in December, information has a way of leaking out early, as may be the case with some details from the future reveal. If an anonymous source at MMOMFG "close to the project" can be believed, del Toro has set out to make the next big RPG trilogy. The source confirms that del Toro visited THQ subsidiary Volition this week, the studio behind Saint's Row and Red Faction. 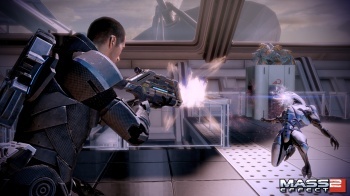 Del Toro's RPG trilogy is said to be "along the lines of Mass Effect," BioWare's sci-fi RPG epic. The plot is rumored to revolve around interdimensional travel, with players tasked to travel through portals and close them. When del Toro said that his game series would be "horror," I'm sure most people's minds went to something closer to Resident Evil. If this rumor rings true, and it definitely could turn out not to, del Toro is putting together something more along the lines of Dead Space with some Elder Scrolls: Oblivion mixed in. In my opinion, Dead Space plus Mass Effect equals good. We'll see if the source is right, or just a damn liar, next month.